In a potentially huge blow to local services like Yelp, CitySearch, and AOLCityGuide, Google is now offering users the ability to leave reviews for businesses they search on. 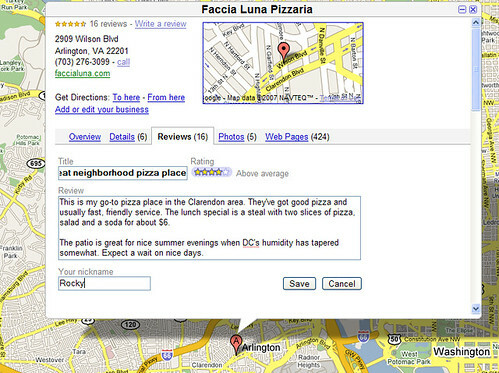 To date, Google has aggregated reviews from those sites and others in its local search results. Now it’s soliciting reviews directly. It lacks the community features of Yelp, but the tight integration into Google Maps will likely serve the needs of casual users. This entry was posted in city guides, google, local search, maps, web 2, web 2.0, yelp. Bookmark the permalink.